Business, Politics, Religion, Culture, what have you . . .
Across the stratosphere, a final message . . .
Well, if Lance can do it, so can I. No, not win seven consecutive Tours de France. Retire. As I mentioned in my first post two months ago, Profits & Prophets has been an experiment to figure out the ins and outs of blogging so I can better help my clients navigate the world of one-to-one marketing. I have learned a tremendous amount about blogging in a relatively short period of time and have truly appreciated your comments and e-mails. Outside of mass media and blogger evangelists, no one else seems to be hyping blogging. That being said, mass media has a very loud voice. So now I am on to new ventures, including a new client focused on health care management in Africa. Should be very cool! At the risk of sounding like a hippy (not that there's anything wrong with that), I wish you all wonder, wisdom and joy. Later! What can you say about Lance Armstrong except, "Wow." 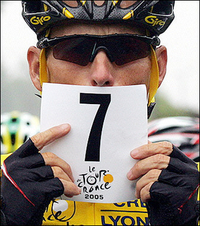 As surely everyone knows by now, Lance Armstrong just won his seventh consecutive (and final) Tour de France. His dedication and perseverance over these many years is a testament to the human spirit. Thank you, Lance, for the exhilaration and inspiration! The AP is reporting on an artist who seems to have been sniffing paint fumes a bit too much. Mark McGowan is an "artist" who has a new exhibit called "Running Water" that consists solely of a running faucet in a small kitchen in a London art gallery. He is going to leave the water running for an entire year to - get this - protest the waste of water in London. The exhibit will be both wasteful and pricey. Over the course of the year, he will waste an estimated 3.9 million gallons of water. Since the exhibit started three weeks ago, he has already wasted 193,000 gallons of water during the driest Summer in London since 1976. I certainly sympathize with the guy's environmentalism, but he seems to have missed the point in his desire to be thought-provoking. To waste 3.9 million gallons of clean drinking water when millions of people on the Earth are dying for want of clean drinking water is unconscionable. This isn't art. It's lack of creativity and laziness. "Art" would have been setting up the exhibit so that a small pump under the sink recirculated the water to the faucet so you would have the image of wastefulness for people to reflect on without actually being wasteful. We can only hope that no donor steps up to fund this stupidity since it sounds like the exhibit will prematurely end as soon as the poorly-funded gallery (who is paying for the exhibit) gets its first water bill. Go ahead and keep broadcasting a steady stream of overly sexual and violent imagery. After all, we've got the V-chip! As a free speech supporter, I'm opposed to censoring the media industry, but that industry's new PauseParentPlay advertising campaign, in which the industry addresses but takes no responsibility for the impact of violent and sexual content on our society, makes it hard to keep fighting the good fight. [The PauseParentPlay advertising campaign's] between-the-lines message is that government regulations are not needed to protect children from overly violent and indecent entertainment content because parents currently have the power to do that. I agree that as parents we have a responsibility to monitor what our kids consume as entertainment, but it would have been good to see the industry make a commitment to take a look at its own role in the impact of overly violent/sexual content on society. Industry initiatives such as PauseParentPlay, with their "we don't need to do anything since it is all the parents' responsibility" mentality, aren't really productive since that type of one-sided approach is by its very nature only a partial solution. Ultimately, the industry needs to realize that if it doesn't take a stronger role in policing itself, it will probably find the government stepping in to do it for them. As such, I think this ad campaign is misguided and largely a waste of money since it won't achieve its desired goal - which is not really to educate parents, but to avoid governmental regulation. 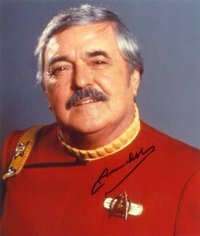 James Doohan, a.k.a. Star Trek's "Scotty," passed away today at the age of 85. "I gave ye all I've got, Cap'n." It used to be colored ribbons on your shirt or lapel. Nowadays, everyone wears colored wristbands to indicate their support for various causes. Though I don't tend to go for such things, I recently jumped on the bandwagon and donned a green wristband to draw attention to the genocide in the Darfur region of Sudan. These wristbands aren't as widely distributed as Lance Armstrong's LIVESTRONG wristbands or the ONE wristbands so I had to order them myself. Well, long story short, they only come in bags of 10 or more. Though several people in my office have already claimed some of the extras, I still have four left. If you would like me to send you one (no cost - but a donation to one of the organizations working in Darfur would be nice), just e-mail me and if you are one of the first four to respond, I will pop one in the mail to you. Today is the 36th anniversary of the Apollo 11 landing on the Moon, marking the first time humans walked on the Moon. For those of you with a love for accuracy, the landing occurred at exactly 4:17:40 p.m. EDT on July 20, 1969. To commemorate this year's Apollo 11 anniversary, a few of Google's engineers created Google Moon (a Moon version of the Google Earth map application). And in typical Google fashion, they had a little fun with it - zoom all the way in on the Moon map to see what I mean. Sorry I've been incommunicado so far this week - I had a new business trip to Tampa yesterday and spent Monday prepping like crazy. On the flight back last night, I read a great article in the current issue of Fortune. In the article, Geoffrey Colvin lays out the current economic and geopolitical situation facing the U.S. and how we are ill-prepared to maintain our world leadership in a future of globalization. It is a very good (if unsettling) articulation of the conventional wisdom/buzz in the business world today that the U.S.'s days as economic world leader may be numbered. The article also lays out some of the changes we need to make as a nation to reclaim a bright future. As an aside (and as you can see on the Fortune cover), the article is illustrated with frames from the old "97-lb. weakling" advertisements that used to be in the backs of comic books in the 1970's (reworked to present the U.S. as the 97-lb. weakling and China as the beach bully). Unfortunately, the online version is not as richly illustrated as the hard copy so get access to a hard copy if you can. Last night I finally sat down and watched the first episode of PBS' new miniseries, Guns, Germs and Steel. All I can say is "Wow." If you haven't seen this yet, you owe it to yourself to watch it because it is one of the most intellectually stimulating programs I have seen in a long time. It got over late but my mind was so active after it was over that I sat down at the computer until 1:30 a.m. and wrote my thoughts about how the show's theories applied to the business and political climate today (an article for another day). Guns, Germs and Steel is based on scientist Jared Diamond's book of the same name. The book and three-part miniseries set out to answer an amazingly simple, yet deep question - "Why did some civilizations grow to amass such technological advancement (and wealth) while other civilizations stagnated?" That is, why is there a New York City and a Silicon Valley when there is also an indigenous population of New Guinea that is still hunting and gathering and barely subsisting through subsistence farming? I won't spoil the details of how Diamond arrives at his theories to answer the question, but Diamond starts by looking back in time 13,000 years ago when there were little if any differences between the human cultures. He discovers a few tiny variations in those societies' geographies that he theorizes set the wheels in motion for the dramatic differences in culture we see today. In this map, red represents "hotter" regions and blue represents "colder" regions. I use quotes because the overall temperature of the background radiation is 2.725 Kelvin (2.725 above absolute zero) or -454.765 degrees below zero Fahrenheit (that's cold, baby!) and the temperature variation between the red zones and the blue zones in this map is only 0.0002 degrees Kelvin! 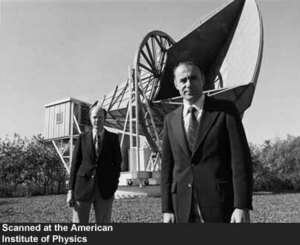 Despite that extremely minuscule variation in temperature, cosmologists think that those variations are responsible for some parts of the universe evolving into clusters and sheets of galaxies while other parts remain utterly void of matter. 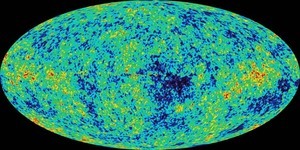 Oversimplifying the situation, a difference of just 0.0002 Kelvin some 13.7 billion years ago meant the difference between a thriving, bustling galaxy cluster and the vast vacuum of space. This brings me back to why watching Guns, Germs and Steel made me think of the CMBR. Just as minor variations in early humanity's geography meant that 13,000 years later some of us would be sitting at computers drinking a latte from Starbucks and some of us would be hoping to find and kill some animal for dinner, minor variations in the CMBR meant that 13.7 billion years later, some molecules would be assembled to be someone sitting at a computer, drinking a latte, while a billion light years away, there are no molecules for vast distances. Anyway, I guess my point in all this rambling is that last night I was reminded how minuscule, almost undetectable variations, multiplied by centuries, millennia and eons, can yield dramatically different situations. The Space Shuttle Discovery is scheduled to launch from the Kennedy Space Center today at 3:51 p.m. EDT. They will have to launch within a five-minute window to be able to rendezvous with the International Space Station. As you are probably aware, this will be the first Shuttle flight since the Space Shuttle Columbia broke up over Texas during re-entry on Feb. 1, 2003. For those of you who don't have NASA TV but still want to watch the launch in real time (as well as the pre-launch and post-launch festivities), you can watch online. UPDATE (7/13/05, 1:35 p.m. EDT): I just heard on NASA TV that the launch has been scrubbed/postponed due to some sort of fuel issue ("one of four low-level fuel cutoff sensors is not functioning properly"). The launch will be delayed until tomorrow at the earliest. Bummer.